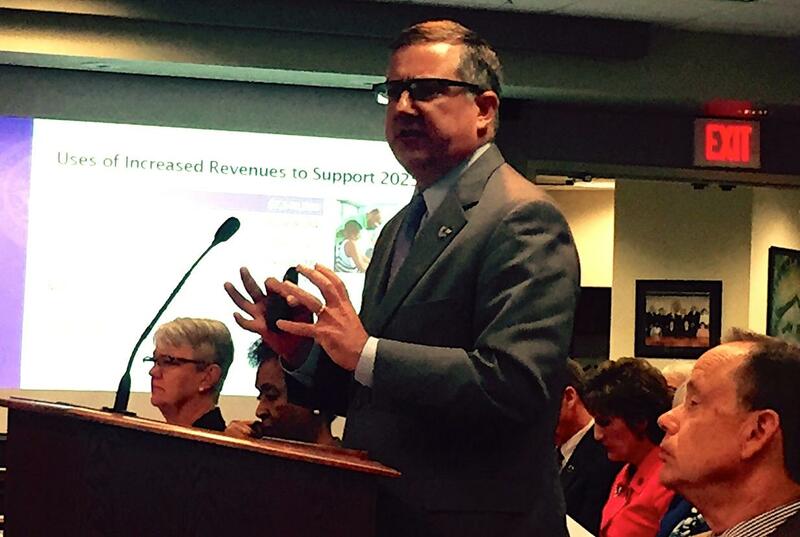 Kansas State University President Kirk Schultz makes a case for higher fees before the Board of Regents. Usually the Kansas Board of Regents has weeks to ponder and discuss how much students will pay in tuition and fees at its six universities. But the 113 day Kansas legislative session has forced those discussions into less than 36 hours. Higher education leaders in the state agreed to a 3.6 percent tuition cap with lawmakers in exchange for not cutting other state funding to universities. However, when Regents got proposals from the schools Wednesday tuition was, indeed, held to a 3.6 percent hike. However, when student fees were added in, every school except Kansas State, exceeded the cap. Those fees tacked onto tuition can be used for anything from student activities to improving intramural and intercollegiate athletic facilities. For example, the University of Kansas proposed a tuition of $4,561 a semester for undergraduate, in-state students next year. That's a $158 hike or 3.6 percent. But with the extra fees the semester cost jumps to $4,853 or a hike of 4.9%. Late in the afternoon on Wednesday the Regents voted to have the universities pare back their proposed tuition and fee schedules to cap fees at 3.6 percent. The schools will scramble to updated numbers so Regents can give final approval Thursday. "I just think it's bad public policy for us to go over 3.6 percent even if fees aren't specifically mentioned in the legislation," Regent Fred Logan from Prairie Village said. "Most people would say a 3.6 percent cap is reasonable." While most of the Board backed the fee cap Bill Feurborn from Garnett was opposed. "It's possibly good P.R. with the Legislature to keep it to 3.6 percent. But the cap on fees with hurt some programs. This is not the letter of the law and not the intent."